".......indeed you are right. Maldives was never an official issue of Goa's governors, nor of the Portuguese Crown. The Portuguese chroniclers, Barros, G. Correia, Castanheda and Couto always referred to Maldives associated with the struggle against Mamale of Cannanore, Calicut and as a place to intercept ships bound to Mecca, specially from Aceh. Even the fort built at Malé was a private adventure." Until about 1950 there was a street in Malé called Andiri Andirin Magu, named after the Regent of King Manoel Siri Dhirikusa Loka (previously known as Hassan IX). This street was to the West of what is now Maafannu Theemuge- the presidential compound. For nearly 400 years the inhabitants of Malé did not find it offensive to have one of their streets named after a compatriot now vilified as a Portuguese invader. Interestingly there was no street named after Bodu Thakurufan (Kateeb of Utheem) until the 1990's. Today the annual Maldive display of fanaticism in bashing the modern state of Portugal has reached an embarrassing crescendo. The scale of ignorance is such that, based on a recently fabricated myth, a respected state of the European Union is insulted every year on the first day of Rabee el-Awwal. That there ever existed Portuguese sovereignty over any part of the Maldives is a myth fabricated relatively recently. No such record exists in Portuguese archives and there is no reference to Portuguese rule in the Tarikh, the official Maldive chronicle written prior to the 20th Century. No doubt the Christian King Manoel Siri Dhirikusa Loka, formerly Sultan Hassan IX, had the moral and some material support of the Portuguese who evangelised him. The bulk of the evidence supports the view that there were Portuguese volunteers or mercenaries under the command of his captains in the expeditions sent to the Maldives. 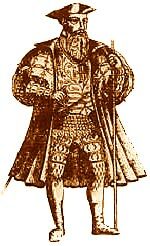 His regent in Malé was Andiri Andirin, a Maldivian by birth and upbringing, albeit of foreign parentage. The Tarikh uses the terms Nasorah (Christian), Kaafaru (infidel) and Faranji ("Frank", a term used interchangeably to mean European and Christian) to refer to the Christian rulers of the Maldives and their Christian subjects. The oral tradition as related by Buraara Koi also refers to the Kaafaru to describe the persuasion of the non-Moslems in the Maldives at that time and only occasionally as Faranji. At the time Malé finally capitulated to Kateeb Mohamed Thakurufan of Uteem, according to Buraara, the expatriates there comprised of Goans (undoubtedly Portuguese subjects), Frenchmen and Malabars and evidently they were all in the employ of Andiri Andirin. It was unlikely that any Portuguese authority would have engaged Frenchmen, subjects of a rival mercantile power. Up until his assumption of the regency in Malé, Andiri Andirin is referred to by Buraara as Goa Kalu Faranji, which means the "black Frank of Goa" or the "black Christian of Goa". Why was he black? At that time it was highly unlikely that there were any dark-skinned people in Europe. The Kingdom of Grenada, the last Moorish (some of whom were dark-skinned) State in Europe fell more than 50 years before to Ferdinand of Aragon and Isabella of Castille. Was Andiri Andirin not Portuguese? The Tarikh and Buraara Koi, however, do refer to the Portuguese quite specifically. For instance there is a reference in the Tarikh to an abortive invasion in 1624 (over fifty years after the so-called Portuguese rule ended), in the reign of King Siri Kula Sundhura Katthiri Bavana (Sultan Shuja'i Mohamed Imaduddine I), headed by a captain "Balbagi". During the regency of Andiri Andirin, undoubtedly there would have been many Portuguese people based in the Maldives, as traders, mercenaries and missionaries. Other European mercantile powers in Asia, the French and the Dutch and later the English would have viewed this arrangement as Portuguese rule. Where transfer of sovereignty had not taken place, Christian mercantile powers at that time operated by establishing spheres of influence and by mutual understanding kept away from each other's sphere of influence. In common usage, European merchants regarded these spheres of influence as being under the rule of the respective mercantile powers. Hassan IX and his fellow converts were probably not the first Maldive Christians. Theophilus, sent by Emperor Constantius (about AD 354) on a mission to Arabia Felix and Abyssinia, was one of the earliest, if not the first. He had been sent when very young a hostage a Divoeis, by the inhabitants of the Maldives, to the Romans in the reign of Constantine the Great. His travels are recorded by Philostorgius, an Arian Greek historian, who relates that Theophilus, after fulfilling his mission to the Homerites, sailed to his island home. (see reference). Theophilus was a well-known physician. Could it be that he was the first Maldive doctor who practised in Europe? Another Roman source, Amianus Marcellinus courtier to the Roman emperor Flavius Claudius Julianus wrote in AD 362 about Maldive envoys that came to the emperor's court. He called the Maldives Divi, which could be another Latin form of Divus. This was undoubtedly the reason why Bell and other European writers such as the Frenchman François Pyrard de Laval had referred to the Portuguese presence as Portuguese rule. In spite of references to Portuguese rule, Bell concedes that the "Islands were then governed by a Native Regent, under the control of the Portuguese Commandant, who ruled in the name of the exiled King Dom Manoel (Hassan IX)". Buraara describes in minute detail the odi (sailing vessel) of the Viyazor, the collector of revenue or Atoluverin of the four atolls to the north of Malé . 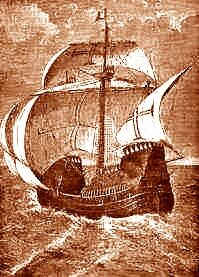 Although the designation of Viyazor was derived from the Portuguese word vedor, interestingly, his vessel flew a plain red flag, and not the Portuguese ensign. From time immemorial until 1903, the flag of the Maldive sovereigns was the plain red flag shown at the top of this page. The Viyazor of Baararh himself sounds very much a Maldivian by disposition, even though Andiri Andirin was supposed to have recruited him in Goa to act as a pilot in his expeditions to capture Malé. If the Viyazor was not a Maldivian, he must have been someone who was very familiar with the Maldives and Maldivian customs, before his arrival with Andiri Andirin. Buraara Koi a narrator of ancient history was politically quite incorrect regarding the personality and character of Mohamed Thakurufan, Kateeb of Utheem who is now given credit for "liberating" the Maldives from "Portuguese rule". Buraara certainly gives Mohamed Thakurufan all the credit worthy of a conquering hero of Islam, but he is also described as an adulterer, a necromancer , a cheat and someone who enjoyed trapping birds into his extended adolescence. Nothing wrong with bird trapping, but duplicity, adultery and necromancy were unbecoming of a knight of Islam, according to conservative commentators who wielded immense power. One such commentator was Hussain Salahuddine, a twentieth century chief justice and one time royal commissioner of history. Buraara�s account was totally unacceptable for Salahuddine, so he revised it and wrote an alternative version. His only evidence and justification for the change was that the traditional version of Mohamed Thakurufan�s character was incompatible with someone who waged Jihad (holy war) for the cause of Islam- very subjective and emotive indeed. Accordingly he systematically and quite openly purged the traditional versions of "objectionable" events and accounts and inserted politically correct material in their place- some of it fabricated by his own admission. Salahuddine bowdlerised Buraara's account, inserting "Portuguese" where Buraara and the Tarikh had used terms such as Kaafaru and Nasorah. Salahuddine was Mohamed Amin Dorhimeyna Kilegefan's father-in-law. Salahuddine�s work on the subject is worthy of literary merit. However as a source of historical or traditional reference, its unreliability cannot be emphasised strongly enough. Salahuddine�s account remains the favoured version with the Maldives authorities. According to Buraara, he had a wife in Goa when he married the widow of the slain Sultan in Malé. No Catholic would have been allowed to divorce his wife, let alone take more than one wife. King Henry VIII had to secede England from the Church of Rome in 1534 because Pope Clement VII would not allow him to divorce Catherine of Aragon. It was highly unlikely that in 1558 Pope Paul IV would have consented the Viyazor of Baararh to take a second wife. Oral tradition describes the Viyazor as a likeable fellow, who occasionally shared a meal with the Thakurufans of Uteem in a communal plate. Moslems would willingly share a meal with Christians, but it was unlikely that they would eat with a Christian from a communal plate. According to Buraara, the Viyazor was steeped in astrology, numerology and dabbled in necromancy. If he were a Portuguese Christian, the Holy Inquisition would have had him burnt at the stake for such heretical activities. The terminology used in the Tarikh to describe the end of the rule of the Christian King and the end of Holin rule in 1752 is also significant. While the end of Christian rule is described as a conversion to Islam, the end of Holin rule is described as a "transfer of ownership of the Kingdom toits people". This means that while the end of Holin rule was clearly recognised as liberation from a foreign power, the author of the Tarikh saw the end of Christian rule merely as a coup d'état. Bell had used translations of the Tarikh in his Monograph. Where the Tarikh clearly uses the terms described above, Bell uses the term "Portuguese", in translation. Whoever was Bell's translator must have been keen to draw a comparison between the colonial history of Ceylon where Bell was born and that of the Maldives. When British rule ended in the countries of Southern Asia in 1947 and 1948, these countries started celebrating independence days or national days. This and the wave of Nationalism sweeping Asia and much of the world at that time dictated that, like other countries, the Maldives also celebrated a so-called "National Day". At a loss for a day, Mohamed Amin Dorhimeyna Kilegefan came up with the idea of appointing the first day of the Islamic lunar month of Rabee-al-Awwal as the National Day of the Maldives. Three and three quarter centuries before on this day, according to the Tarikh, Mohamed Thakurufan kateeb of Uteem assassinated Andiri Andirin and seized control of Malé. Many traditional versions, including Buraara place the date of the event in the month of Rajab. Raabee-el-Awwal is, of course, holier in the Islamic calendar. The National Day had to be romanticised with the defeat of a colonial European power. The myth of Portuguese rule over the Maldives was thus fabricated, institutionalised and committed to official history. The myth of Portuguese rule is perpetuated annually since the late 1940's. 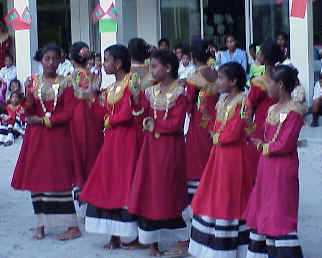 All manner of festivities, including school children made to perform quaint dances dubbed "cultural", take place every year. These celebrations were canned in 1965 by Prime Minister Ibrahim Nasir Rannabandeyri Kilegefan, until reinstated by the regime that succeeded his presidency.